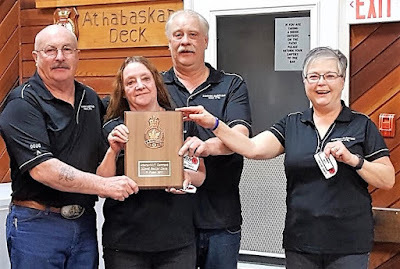 Doug Smith - Pictured above left to right, Doug and Linda Smith of Pincher Creek pose with Rod Peake and Bernice Carrier from Lethbridge after winning the Royal Canadian Legion Alberta / Northwest Territories Senior Mixed Darts tournament, held February 24 and 25, 2017. The tournament was hosted at the Fort Saskatchewan Legion Branch # 27. The team was representing the Lethbridge-based Royal Canadian Legion General Stewart Branch #4. The team won the fourth and highest available level in darts competition, after competing against 16 teams in a total of 48 games. The winners won 34 games. Also, team player Rod Peake from Lethbridge threw a perfect score of 180.